Rancho Mission Viejo’s new website offers us a hint at the retail component of Planning Area 1. 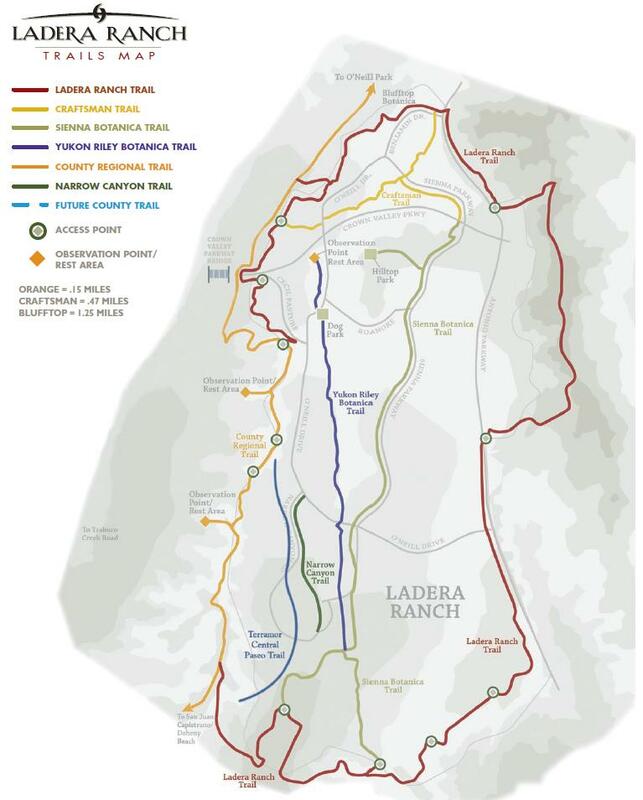 The site invites future residents to “[l]oad up on supplies at our 10-acre retail plaza (planned for 2015)” and promises that “[y]ou’ll find everything you need from groceries and gas to take-out and dry cleaning right here on The Ranch.” We know from our Detailed Look at Planning Area 1 that subarea 1.4 (the portion of Planning Area 1 that contains the retail component) was approved for up to 100,000 square feet of retail space. Finally, we want to address the comments on Rancho Mission Viejo’s Facebook page asking for, and in some cases predicting, that a Target store is coming to town. We thought we’d play urban planner for a day and try to predict what the Ranch Marketplace retail plaza at the corner of Antonio and Ortega might look like. The first question is exactly how much retail space is 100,000 square feet. A full-service grocery store requires about 50,000 square feet of retail space. Taking a step down in size, a typical drug store is about 13,000 square feet. A free-standing fast food restaurant with a drive through might require 3-4,000 square feet, while a smaller attached unit might require 1,500-2,000 square feet of retail space. A more formal dine-in restaurant could require 5-6,000 square feet or more. A bank branch might be a similar size. A gas station with a convenient store will require between 3-4,000 square feet, but will have a large footprint to account for the gas pumps and traffic lanes. Note that freestanding buildings will generally require additional space for extra parking and egress/ingress. This retail shopping center is located on 10 acres and features almost exactly 100,000 square feet of retail space. It is anchored by a grocery store (B) and features a drug store (I), several dining options ranging from a free standing fast food restaurant (G) to attached casual dining, and multiple other stores and services, including a gas station (H). There is a lovely outdoor dining patio in the upper left hand corner and ample parking throughout. Do you recognize this shopping center? It’s Bridgepark in Ladera Ranch. Incidentally, Bridgepark has always been our favorite of the Ladera Ranch retail centers. It feels more comfortable, more intimate and its tenants have been a stable mix of essential goods and services. Maybe that’s because (according to the developers) “the plaza was designed to convey an old-fashioned town-and-country style shopping plaza complete with [a] water tower.” That attention to detail survives in Bridgepark. Even though it is the oldest of the Ladera retail plazas, it remains among the most popular. Mercantile West is a nice facility, but lacks that small town intimacy. It feels somewhat sterile, disjointed and disconnected. Further, while Mercantile West has had a couple great tenants, small, locally owned businesses do not seem to survive long there, which is unfortunate. We are not fans of the retail centers at Mercantile East and the Terrace Shops. They are poorly designed, too commercial and the tenant mix strikes us as generic and forgettable. Let’s hope that Rancho Mission Viejo returns to its roots with something that looks and feels more like Bridgepark. Let’s now tackle the question of what specific stores we might expect to see in the new Ranch Marketplace. Will there be a Target in the shopping center at the corner of Antonio and Ortega? Not likely. Target stores are just too big for this space. The average general merchandise Target store is approximately 126,000 square feet in size and the SuperTarget stores average almost 200,000 square feet. In addition, the traffic created by a Target requires easier access to and from a much bigger parking lot. We seriously doubt that there will be a Target at the new Rancho Mission Viejo retail plaza at Antonio and Ortega. 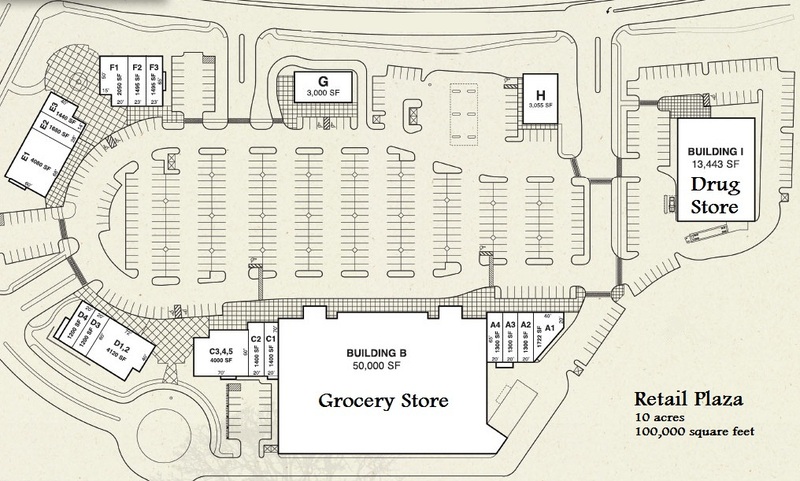 There will be a grocery store in that retail plaza, however. As mentioned above, a typical supermarket requires about 50,000 square feet of space. 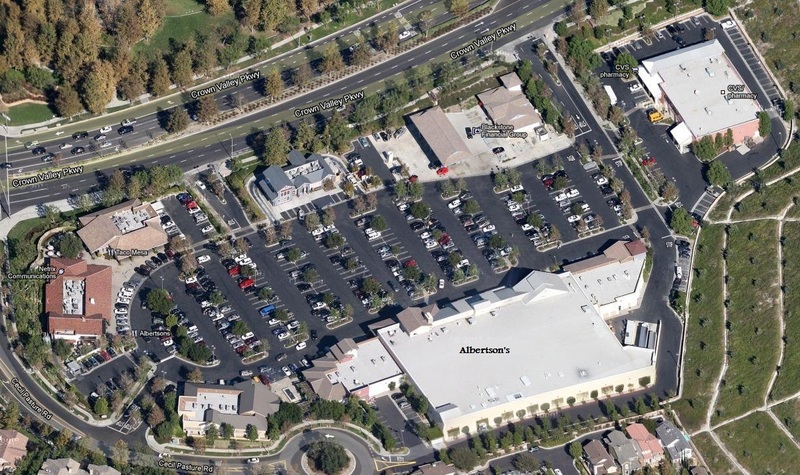 Examples of grocery stores this size include Ladera Ranch’s two grocery stores — the Pavilions at Mercantile West and the Albertson’s at Bridgepark. A combo store that includes a supermarket and a full service pharmacy might exceed 60,000 square feet. But considering Sendero’s “Ranch living” marketing campaign, is it possible that we will see a specialty grocer in this location? Yes. Trader Joe’s stores run smaller than the average chain grocer — part of the reason why TJ’s earns some of the highest revenue per square foot in the grocery industry. An average Trader Joe’s might run between 10-12,000 square feet. A TJ’s would leave ample room for other tenants (including a larger dine-in establishment which we have thus far not considered), but it would leave the plaza without a dominant anchor. How about Whole Foods? South County currently lacks a Whole Foods, although several locations are purportedly in the works. Whole Foods’ image is certainly consistent with the Sendero marketing materials. Could that shopping center handle a Whole Foods? In short, yes. While Whole Foods stores have historically been larger than the average supermarket (it’s largest store is 80,000 square feet in Austin, Texas), it has recently announced that it will be targeting smaller locations for future store openings. The target location will be between 35,000 and 50,000 square feet, more than 20% less than its historical “sweet spot.” Other stores like a Mother’s Market, Henry’s or Sprouts might also be good matches with the new “Ranch” community. 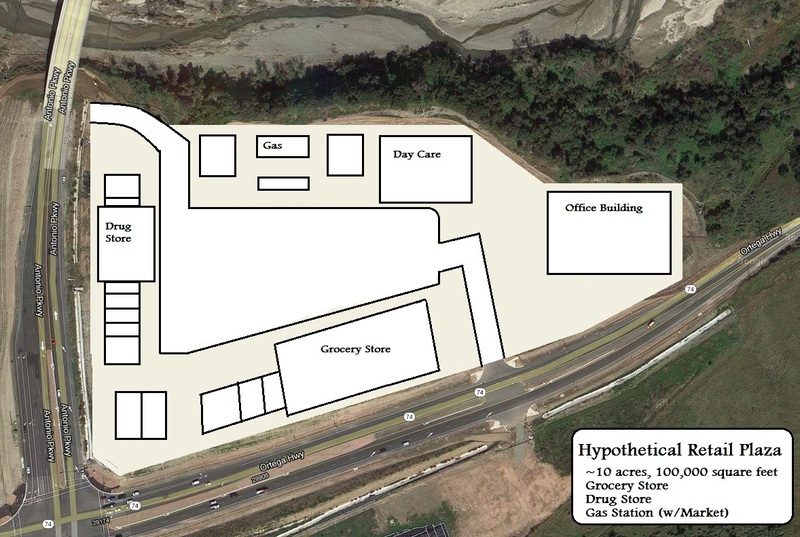 Obviously the exact layout of the retail plaza remains to be seen, but just for fun we marked up the actual location with a hypothetical shopping center anchored by a grocery store, drug store and gas station. It includes two free standing buildings that could be casual restaurants, bank branches or some other retail establishment. It also includes two wings of smaller, attached retail units and another freestanding building in an area that could host a dining patio. Obviously, it’s not to scale — just a “back of the napkin” illustration of how things might be laid out. 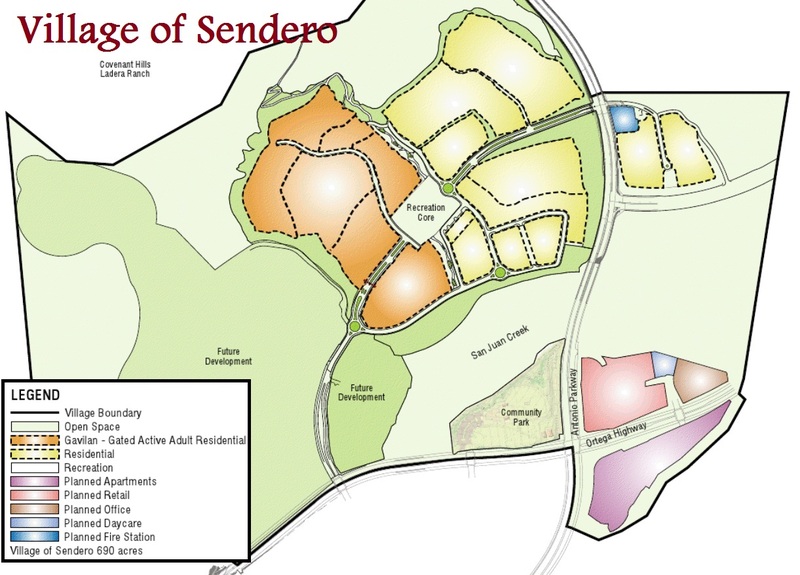 We’ve also shown the day care center and office building (neither are included in the 100,000 square feet) that will be located adjacent to the retail plaza, according to this map of Sendero. One thing we don’t like about our layout below is that it doesn’t make any effort to integrate the retail plaza with San Juan Creek. If we were truly designing this retail plaza, we would spend the time to orient the dining and pedestrian aspects of the plaza towards the creek and really embrace the location of this property. What do you think? It’s certainly going to change the character of the area — a far cry from the open space and fields that were there just a couple years ago. In our opinion, that change is inevitable. But as we’ve mentioned before, this retail plaza will serve as the gateway to Rancho Mission Viejo and will brand the community. It could be a generic strip mall that greets visitors with more gas stations, fast food joints and another expanse of asphalt parking lot. Or, it could be designed well, reinforcing the feeling that this is a special community built on a special place, existing in harmony with the land. Let’s check back in 2015 to see how things turned out, shall we?